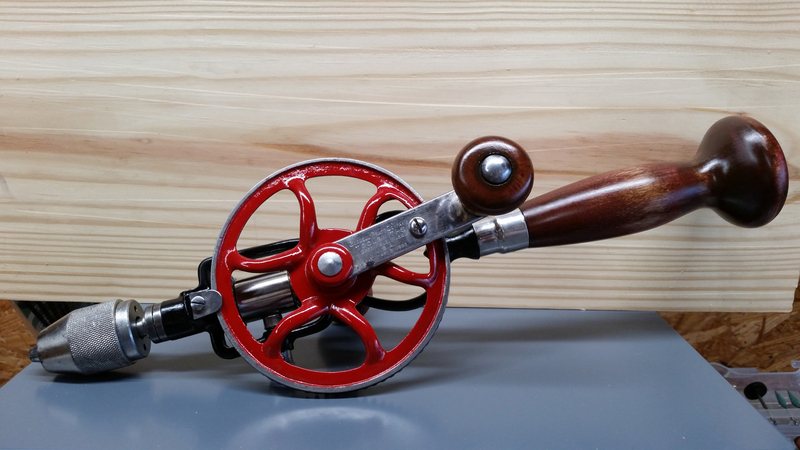 I recently completed a restoration of a Goodell-Pratt 5 1/2 B two-speed hand drill. The 5 1/2 B was produced by G-P between 1898 and 1936, and based on the mahogany-finished hardwood handle, I believe this one is post-1926, making it approximately 90 years old, though I could be off a smidge. 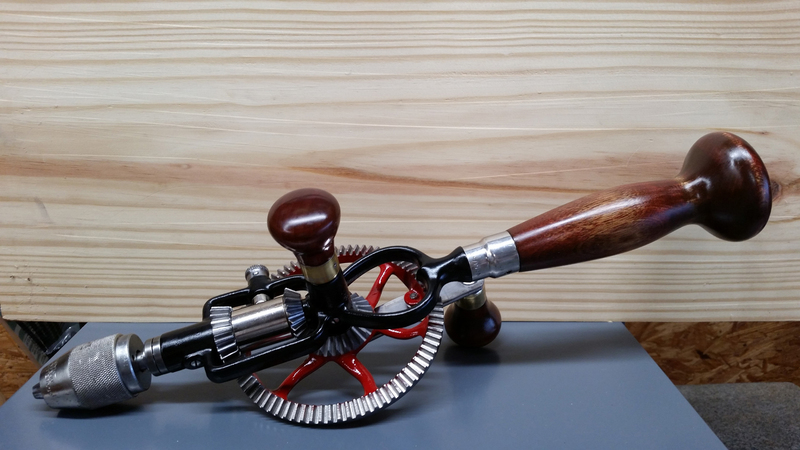 Old Tool Heaven has a great G-P hand drill information page if you’d like to read more about this model or others. 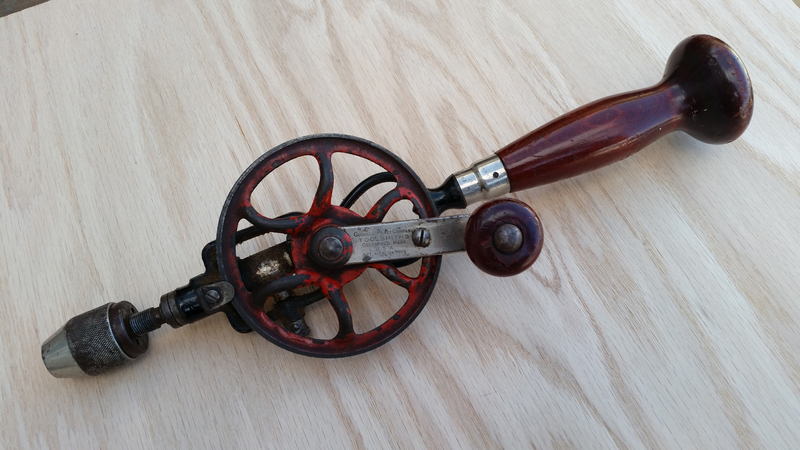 Now, let me walk you through my restoration, starting with ‘before’ photos of the drill as I received it. 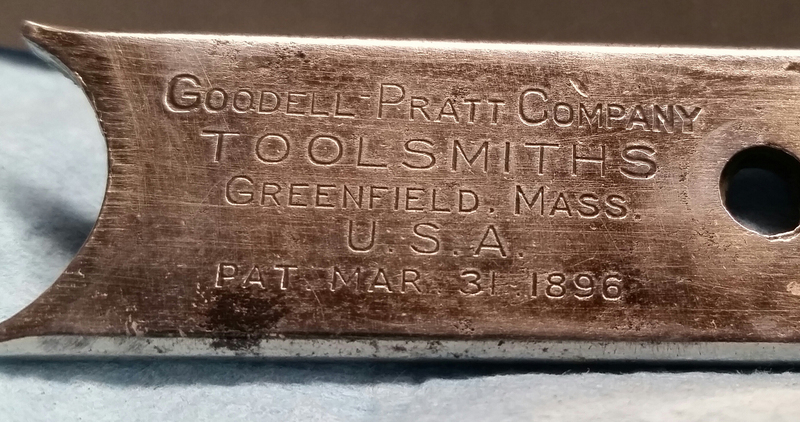 Goodell-Pratt 5 1/2 B, fresh from the wild. 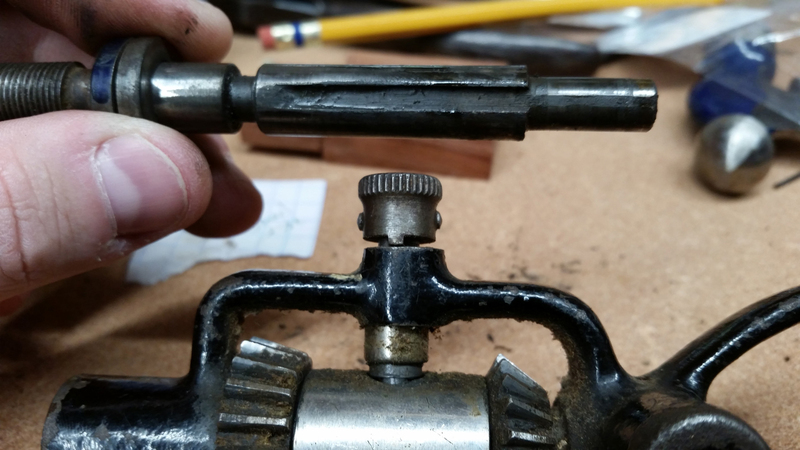 The drill was intact, with the exception of a missing side handle and a jammed chuck. 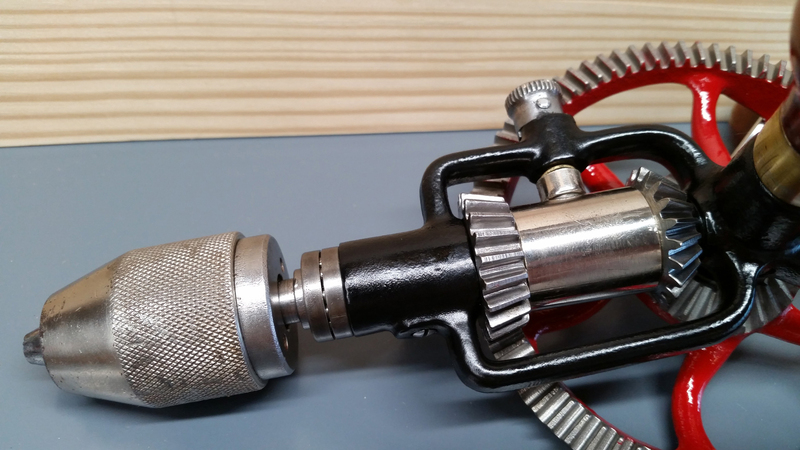 The back of the drill reveals the speed shifter assembly and a missing side handle. The wheel guide helps keep the main wheel gear on track. Everything turned, but the shifter was a mess. At least nothing was cracked, which would be fatally render this a ‘parts’ drill. 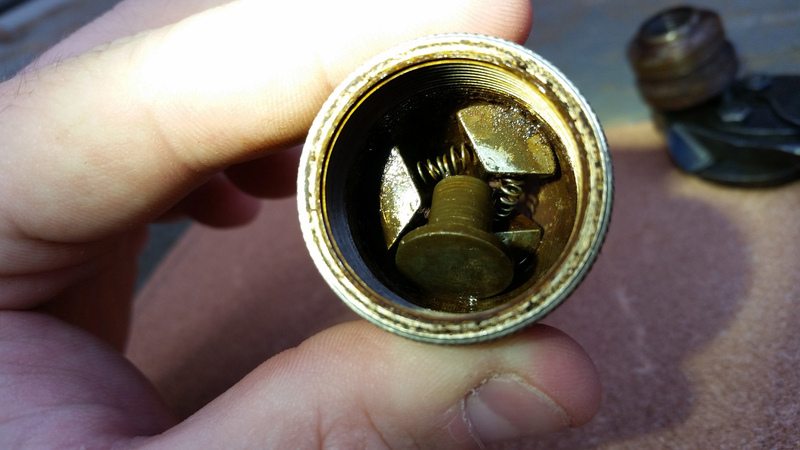 The chuck was rusty and jammed due to damaged internal springs. 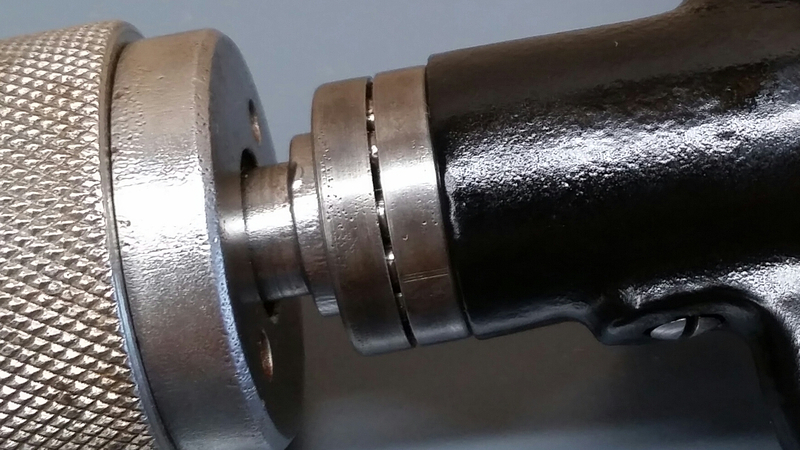 Notice that the chuck springs are stretched and bent, and the internal surfaces of the chuck are rusty, preventing the teeth from smoothly sliding into position. I had to make do without a pin spanner. 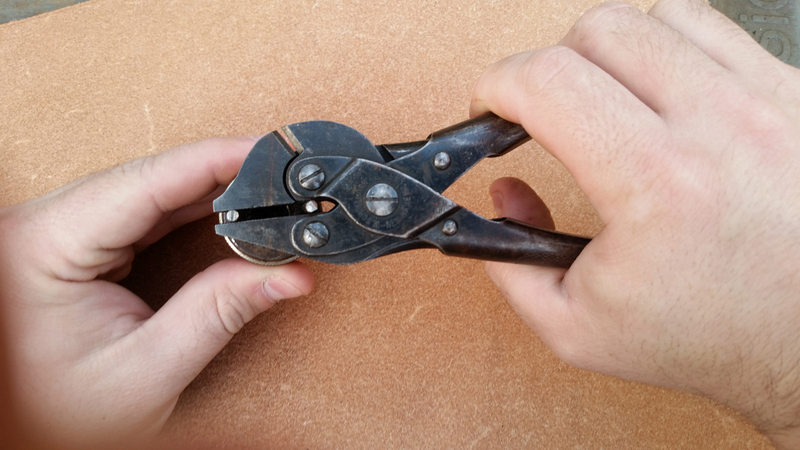 Two steel pins inserted into the chuck holes can be grasped with a pair of Bernard parallel jaw pliers. Then, some careful twisting opens the back of the chuck. Chuck components. The springs were replaced with stainless steel compression springs [1/8″ (0.125″) O.D. ; 25 AWG (0.020″ wire diam. ); R3.57N] that I cut to length based on the original ones. I bought them from http://springsandthings.me.uk. 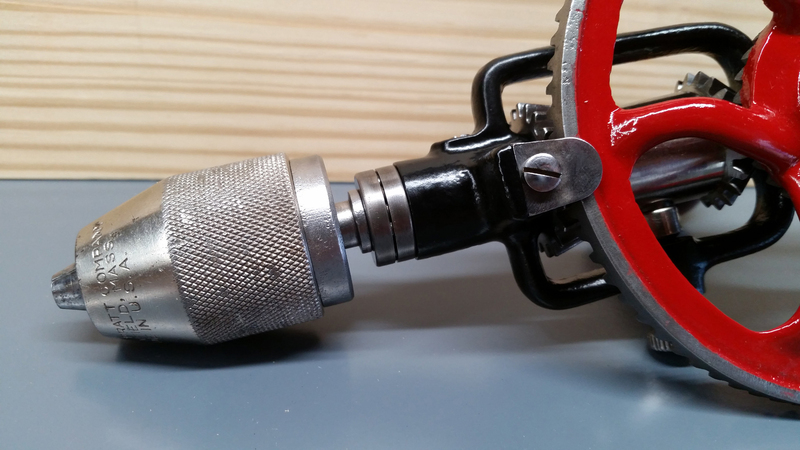 All other components of the chuck was polished inside and out, then it was oiled and reassembled. The shifter assembly is keyed to fit onto the spindle shaft. The whole thing was a greasy, dirty mess. Before you remove the spindle, be aware of the ball bearings captured in the two cups behind the chuck, as seen in this photo. They’ll go flying if you remove the spindle without care. I suggest opening it inside of a gallon size ziplock baggie to catch anything that might fall out. Shifter components removed from the frame. 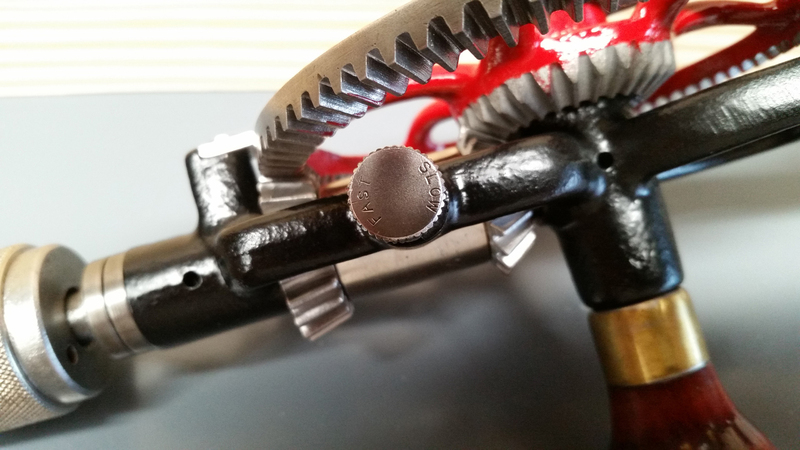 The knob engages through the circular hole in the case into the grove around the waist of the central piece, shifting it left or right (in the photo) to engage the slots in one gear or the other. 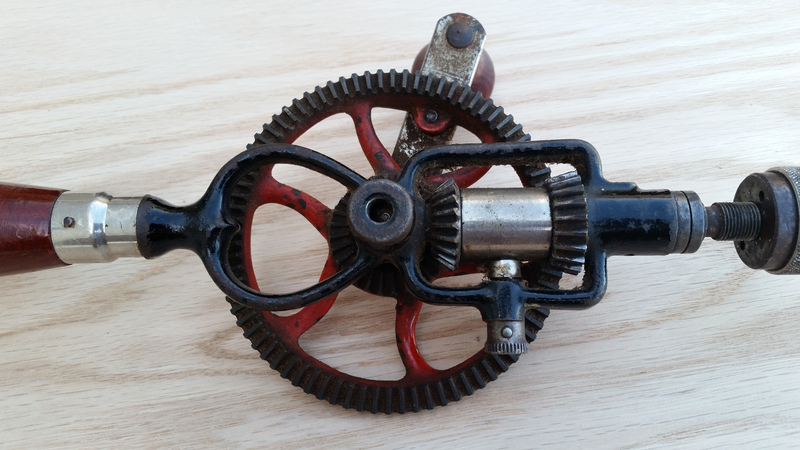 The unengaged gear free-spins. 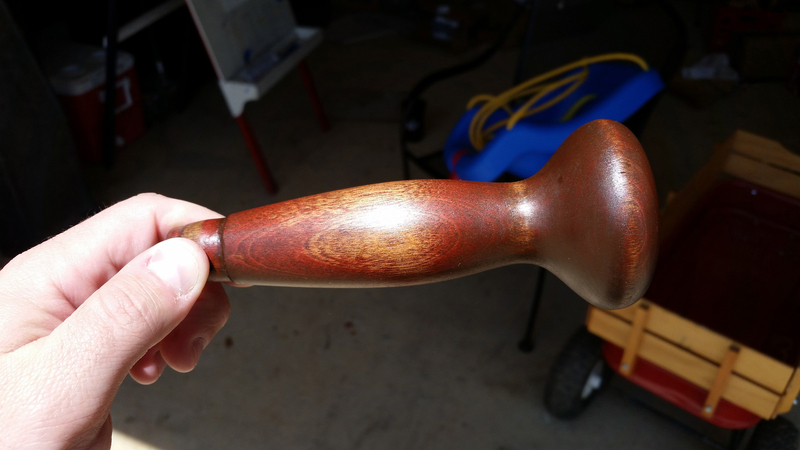 Main handle – stripped, sanded to 400 grit, stained, several coats of water based poly, and some paste wax to finish. The crank handle is riveted, and I did not want to disassemble it, so I placed it in a bag of alcohol to remove the finish. 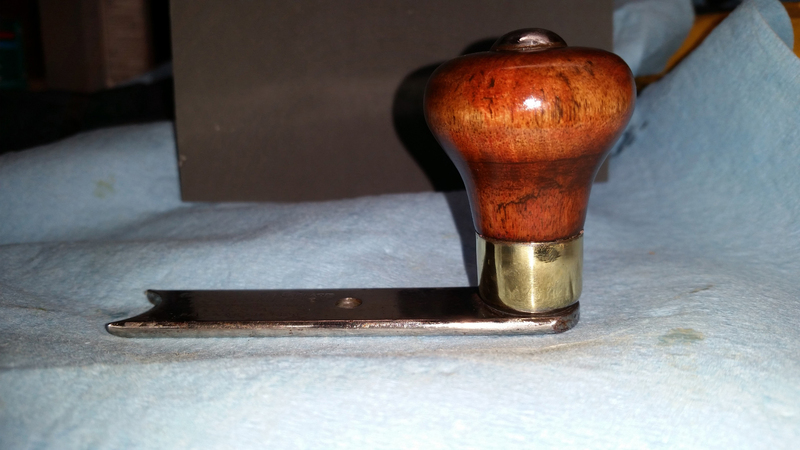 Crank handle – stripped, sanded to 400, stained, several coats of water-based poly, paste wax, and the metal parts polished with green buffing compound. 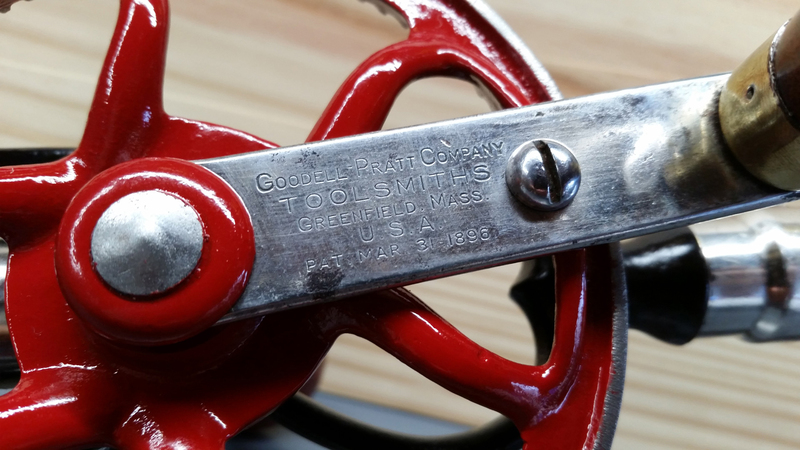 The chuck was cleaned, polished, oiled, and reassembled. The chuck reads: GOODELL-PRATT GREENFIELD, MASS. MADE IN U.S.A. 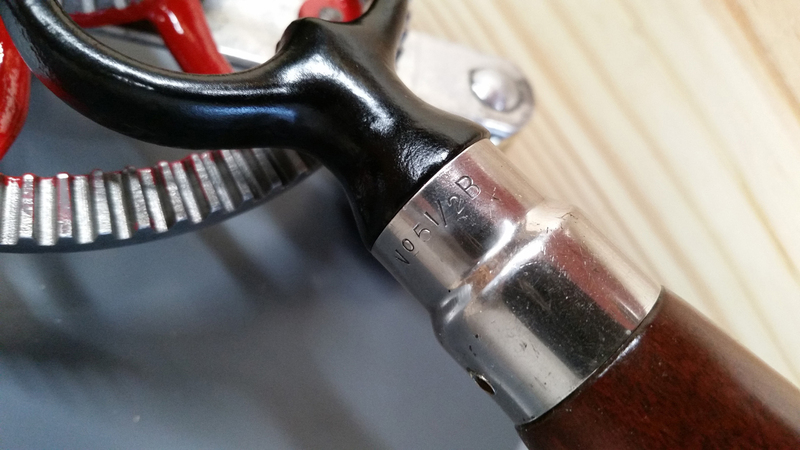 The main handle ferrule is stamped “No. 5 1/2 B”. 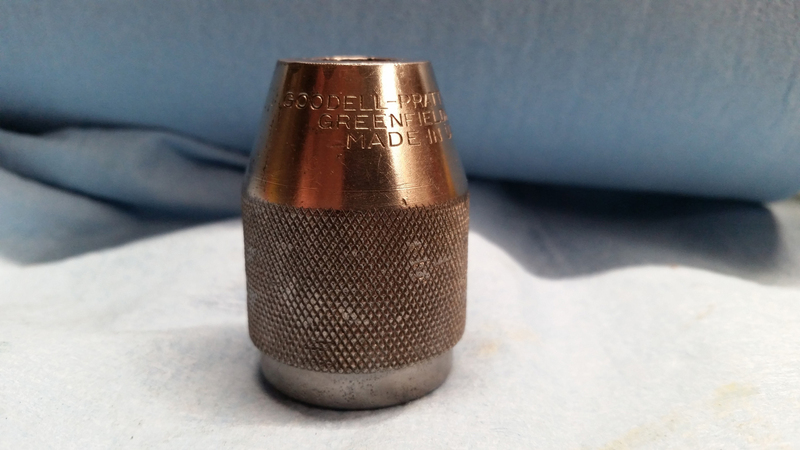 Note the hole for a steel pin. 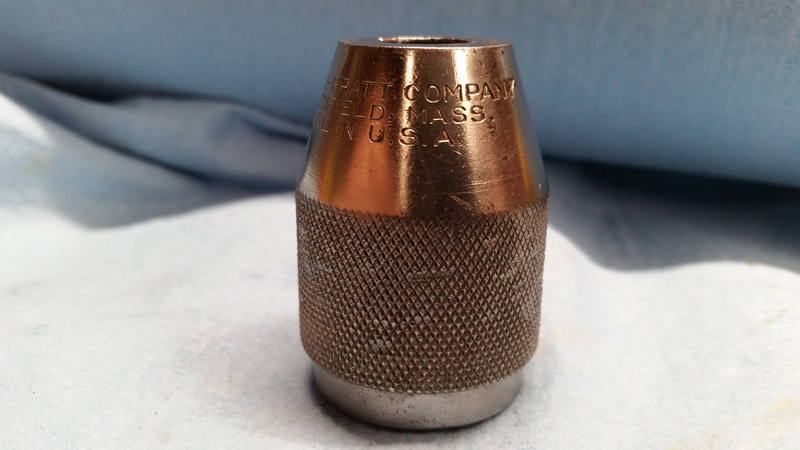 This is a nickel-plated brass part, and if excessively sanded, the brass will show through. 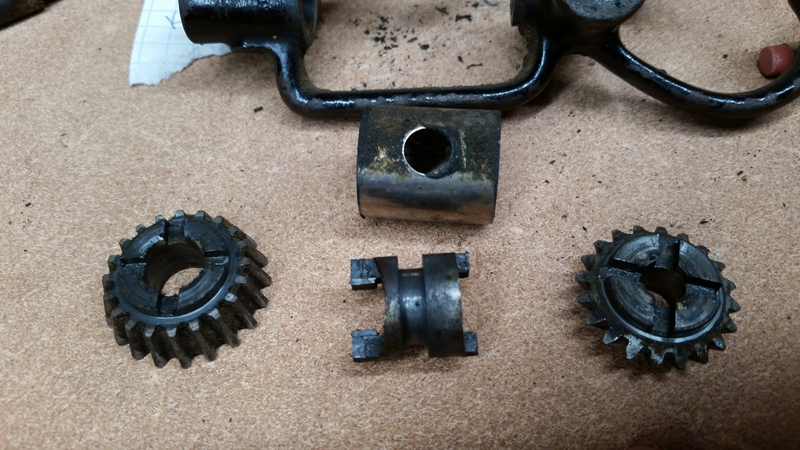 The shifter components and the spindle were cleaned and polished before reassembly. 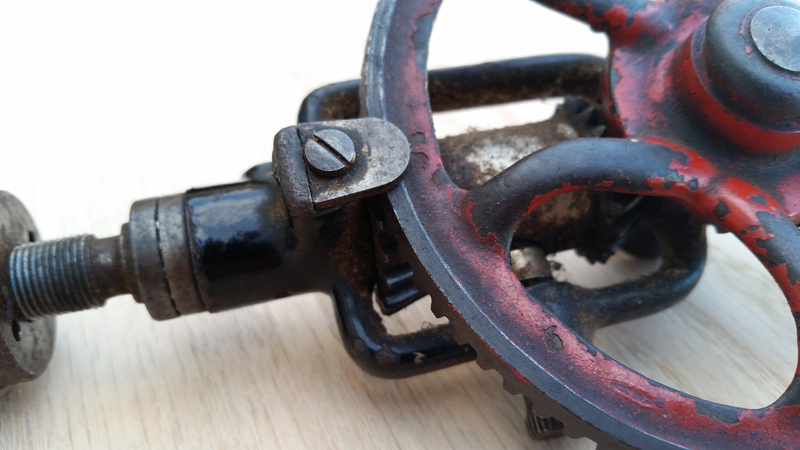 Crank handle, showing some minor evidence of past rust. It’s shinier in person – the lighting makes it all look dull. Restored and reassembled. The frame was painted in semi-gloss black Duplicolor engine enamel, and the wheel in red Duplicolor. Restored, rear side. The side knob is off a Millers Falls no. 5 drill. So there it is, all cleaned up and restored. I like to think that it looks as good or better than it did when first sold. 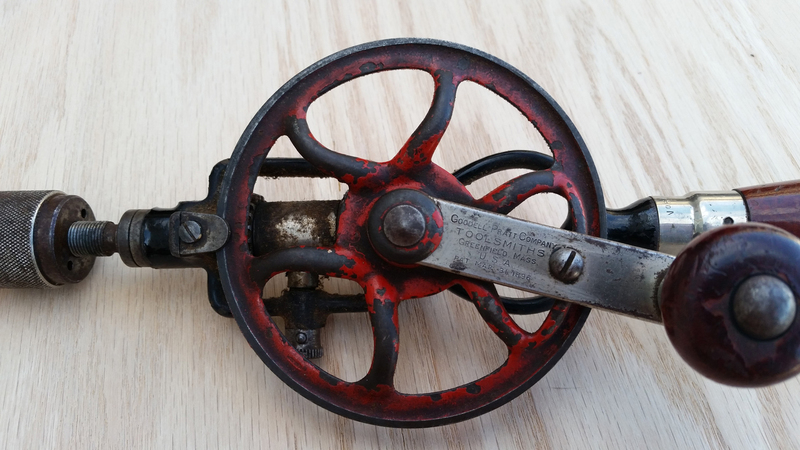 I intend to use this in my shop, so this is probably as good as it will look for the next 50 years, until (perhaps) my son or daughter decides to restore it. There’s no reason why this drill shouldn’t provide another 90 years of service now. Good job I am proud of you. you forgot to warn about the main shaft bearing, full of tiny ball bearings that bounce all over the floor if you’re not careful !! Dammit !! Rob – Wow, I’m sorry I didn’t mention that. I know I referred to ball bearings in the post, and I think I’ve photographed them in some of the Millers Falls restorations, but I didn’t include a photo of the bearings in this Goodell-Pratt restoration. I’ll add a photo if I can find one. I hope you found all your bearings. I’ve definitely been in the position of scrounging around on the floor looking for them myself. 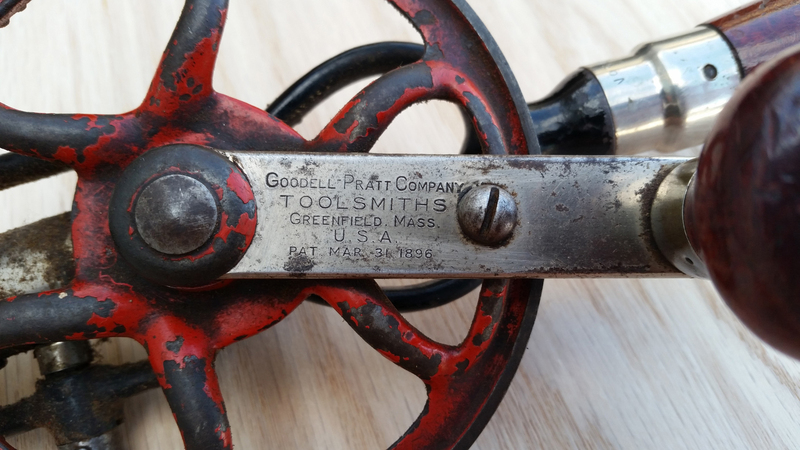 I was fortunate enough to pick up a Goodell Pratt 51/2 drill at a very reasonable price today, 14 USD. Al parts are there except the springs in the chuck, no big deal, I can fix that. 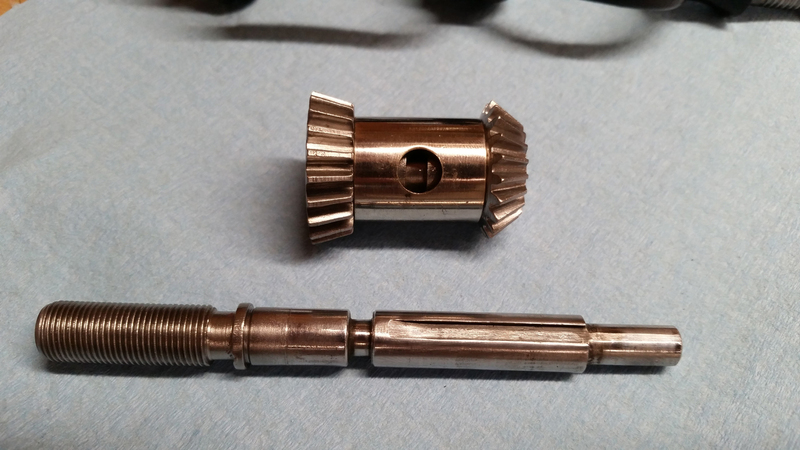 However, when un-screwing the handle I found that the were no female threads , not even a scratch. Someone had used paper around the male thread and jammed it into the hole in the handle. 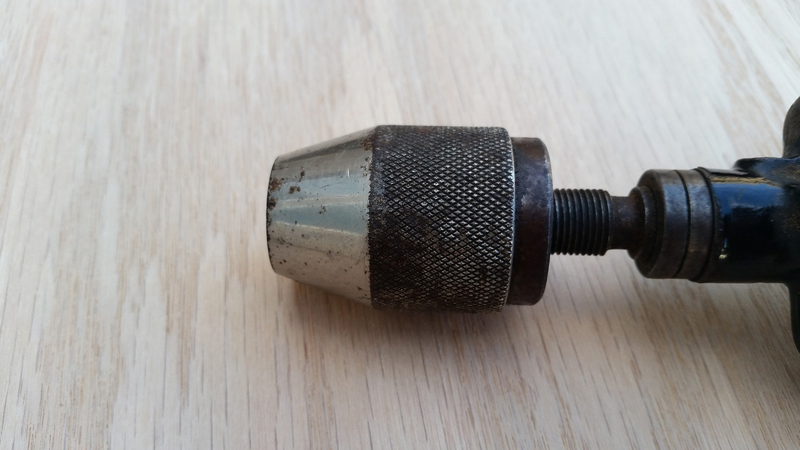 Was there a wooden thread in the handle or should there have been some sort of glued in metal bushing? 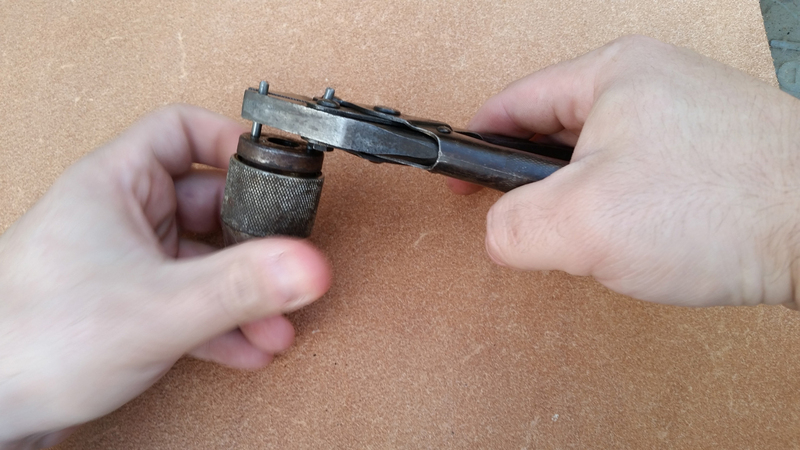 On all of my G-P and MF hand drills, the frame threads into wooden threads in the handle. They’re not usually particularly snug, but they used a pin to hold things securely. 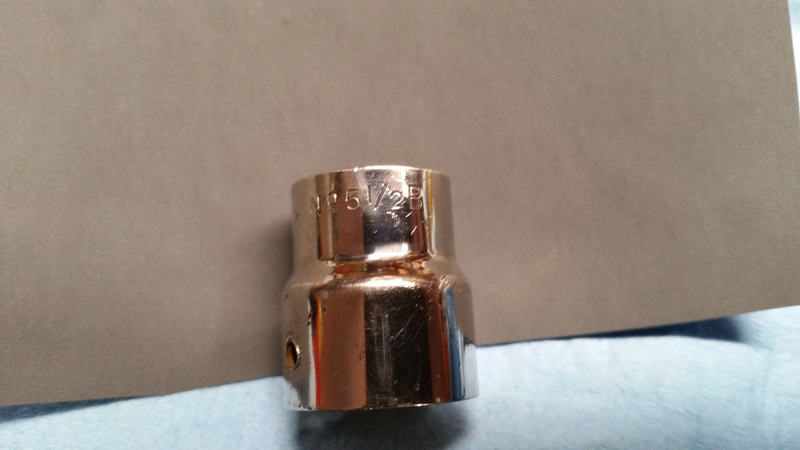 Sounds like maybe someone stripped out the original threads, but as you said there wasn’t even a scratch inside the handle, I’m not really sure. What a mystery! 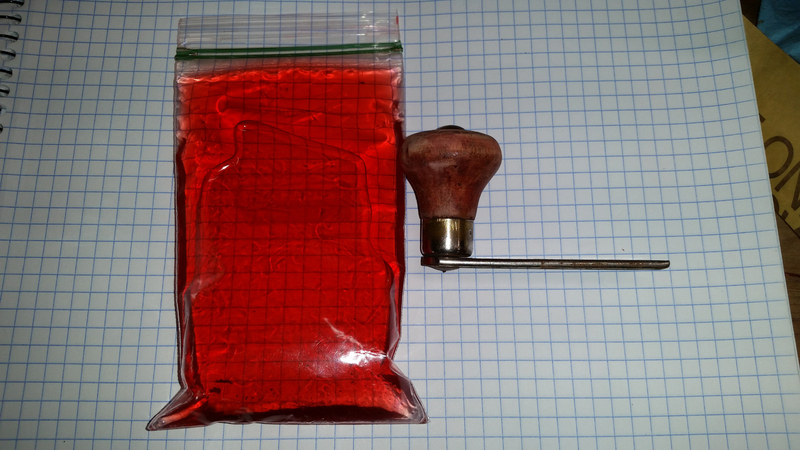 I’d say you should first try the paper trick again, and see if the pin secures the handle to the frame sufficiently. You don’t want it wallering around, or it might eventually crack the handle. I suppose in a very last resort, you could use some sort of epoxy, but I don’t think that’s a great solution (it’s permanent, so that will be the last time you get to remove the handle). Interesting conundrum. Thanks for sharing it! Thanks for visiting my site. 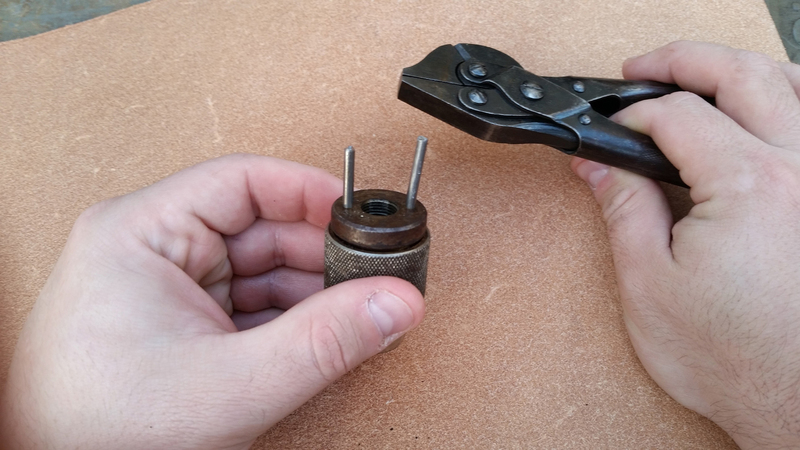 Finding chuck components can be a really difficult thing to do. 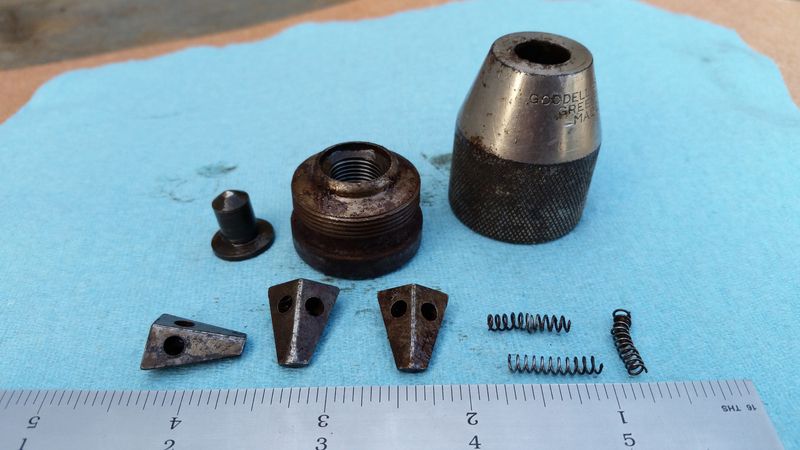 For the hardware (minus the springs), you usually have to find a broken drill and salvage parts. 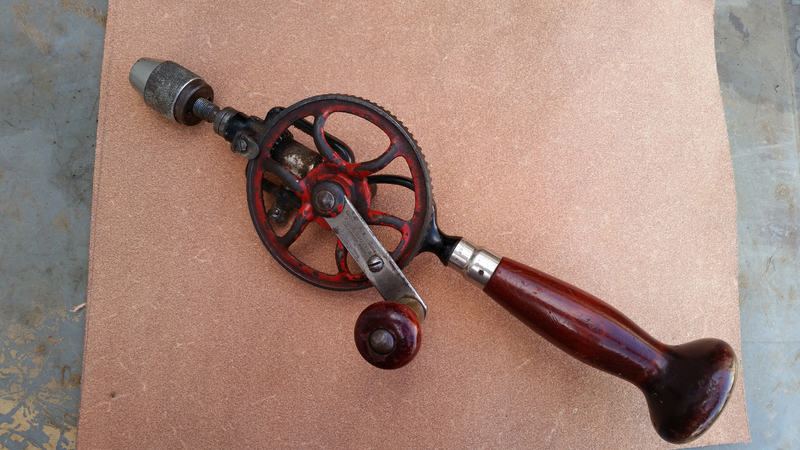 Some of the facebook antique tools groups may have folks with spare parts who can help. For springs – I talk about replacing compression springs in my blog entry here. If you have the bent wire-type springs, I remember seeing another guy’s blog out there where he deals with making some new ones. I’m sorry, I don’t have a link handy. But a little googling should turn it up (unless it’s on Wiktor Kuc’s page, which I think has since been taken down). But, if you need jaws, or the case, or things like that, you’re probably going to be looking at trying to find an old ‘parts’ tool to scavenge. Honestly, unless it’s a rare tool, at that part, I’d consider *the drill I had* to be the ‘parts drill’, and move on to a complete piece. I wouldn’t start a restoration unless I already knew the tool had all the parts there. Maybe help another guy out by selling the frame or something else they needed off the one with a bad chuck. Sorry I couldn’t be more help on this one. Good luck! Thanks for the advice MP! The one I have was my Great Grandfathers so I would like to restore it. Will take your advice and find one for parts on Ebay.